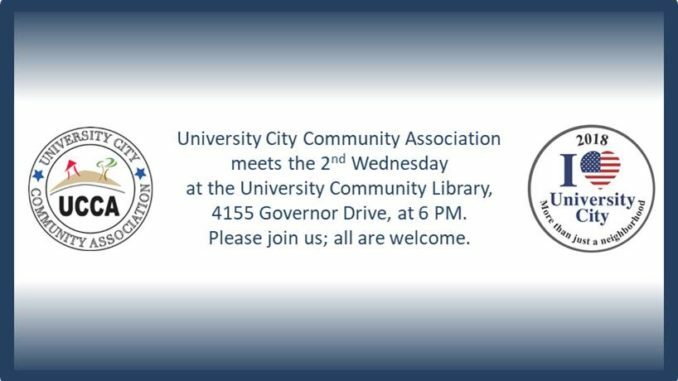 University City Community Association (UCCA) will host its monthly community meeting on Wednesday, May 9 @ 6 to 7:30 PM, at the University Community Library, 4155 Governor Drive. This is a community meeting featuring updates from law enforcement, fire-rescue service, legislative and other community leaders. We will be begin setting up shortly after 5:30 so please feel free to arrive early to meet your neighbors and network. All are welcome. University City Community Association (UCCA) is a non-profit (501c4) organization funded through membership dues, which provides and promotes the civic, cultural, social, educational and recreational development and improvement in University; and provides a forum where the interests of residents may be expressed and contributions made to the protection of life and property in the community. If you have an agenda item to suggest or wish to speak during open forum, please contact us using the ‘contact us’ page at https://www.universitycitynews.org/ or leave us a voice mail at 858-412-0786 or email us at universitycitynews@gmail.com. MAY 9, 2018- 6:00 P.M.
H. WEATHERSPOON, UNIVERSITY SQUARE MGR.